Fresh out of design school, I was conscious of the “ways of seeing”. 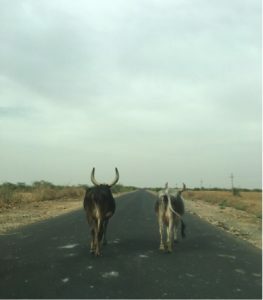 When my eyes took-in the sights of Banni for the first time, I was awe-struck! In Banni, the horizon stretches forever and that scene is etched in my memory. It is hard to describe the feeling when you behold such stark grandeur, for the magic of Banni lies in seeing and experiencing… the place and the people! 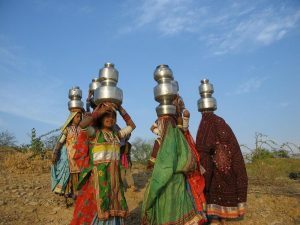 Banni are the arid grasslands of Kutch that were once lush productive fields fed by the mighty Indus and its tributaries – these are almost forgotten times. The river changed course over the last two hundred years leaving behind rich deposits in the soils. This flat plain land extends for miles into the horizon, feeding livestock onto salubrious grass, while their human masters stare above into cotton clouds. It is a common sight to see the cowherd, perched on a tree top, to scan his cattle, and surely to watch the beauty of the skies in their soft shades. 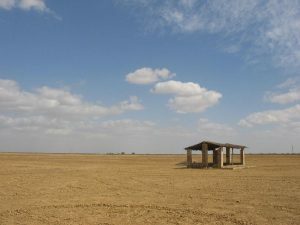 The nutritious soil helps immensely in the cattle of Kutch being prized possessions. A parallel Gir breed from southern Gujarat was exported to Brazil as early as the 1870s for its hardiness and to improve the strand of cattle there. 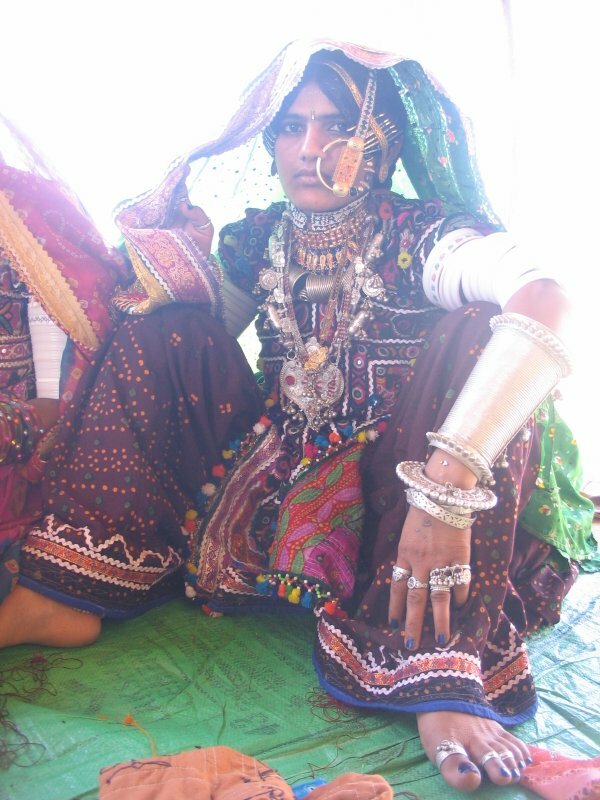 Sadly, the original Kutch breeds are on the verge of extinction here in India. These cattle are under the care and ownership of Maldhari people ie, owner of “Maal” in the form of livestock. Maldhari is a generic occupational title for both Hindu and Muslim communities, including the Rabari, Ahir, Jat Muslims, etc. It is said that these nomadic people have roamed this region since the days of the Harappan civilisations. While the Harappan settlements were built metropolis, they were surrounded with nomadic pastoralists and early agriculturists in symbiotic relationships. This is an ancient land that taught its people survival comes from being interdependent and diverse. Each community is a specialist and supported by an associated community. The Meghwals are a talented lot, to say the least. Their occupations include weaving, leather tanning and production, wood carving, etc. 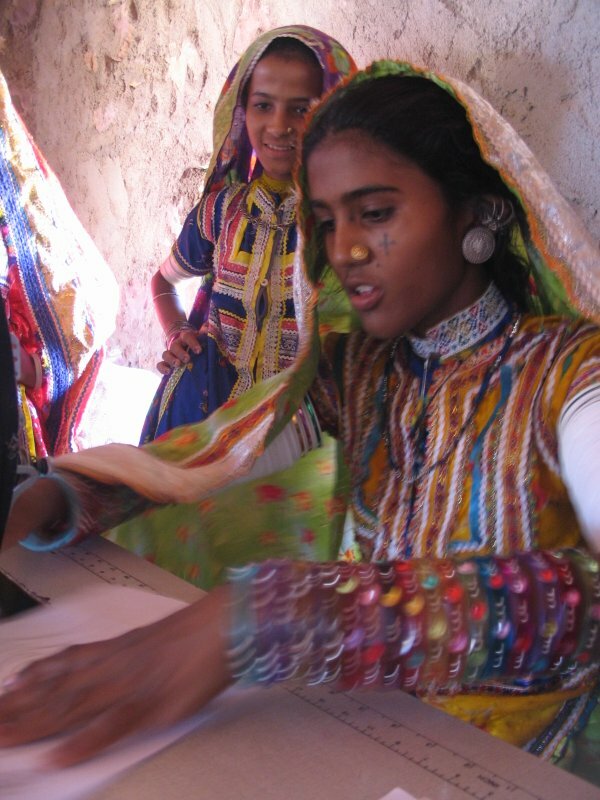 This community, living along side the Maldharis, were traditionally expert tanners, converting raw hide to leather. These are symbiotic relationship, explains Judy Frater, as they live and work in tandem. In the Rudramata cluster of villages, I visited the house of Bhoja Bhai, the coordinator for our leather workshop. The workshop went off well – we achieved the target of training, product development and other related tasks. The real learning came from time spent following the working hours; hanging around the village with the younger girls and boys, each of whom showed me their houses, always, always with an invitation for tea. Rudramata is a cluster of Meghwal villages, a highland kissed by the Rudramata river. In the evenings the younger girls get together to fill drinking water from the river. It’s their fun time out; cheerful and vivacious, they help with household work with the same enthusiasm as they play around. 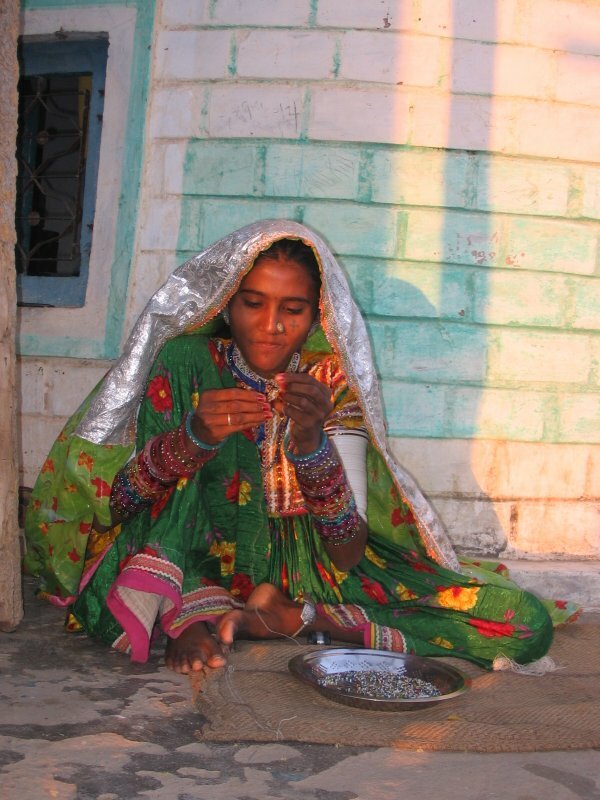 Thirteen year old Dai is proficient on the sewing machine, spends her afternoons beading fine necklaces with intricate designs. Her friend made this crossed shaped tattoo for her on the cheek using a red hot needle! Welcome to fashion pressures of the young! 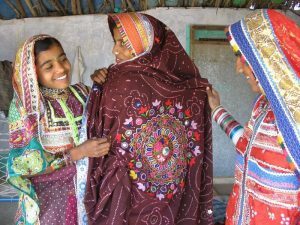 Formal education aside, one of the most important life skills that the girls learn and inherit is the art of embroidery. Each afternoon, post lunch, sitting around in the courtyard of the bunga, the older women gather around to talk, embroider and help each with chores. The really little ones that accompany their mothers to these soirees are quick to take a blunt needle and get busy role-playing their mother and aunts, as if these tots were creating the finest embroideries. Maybe they will, maybe even greater achievements! 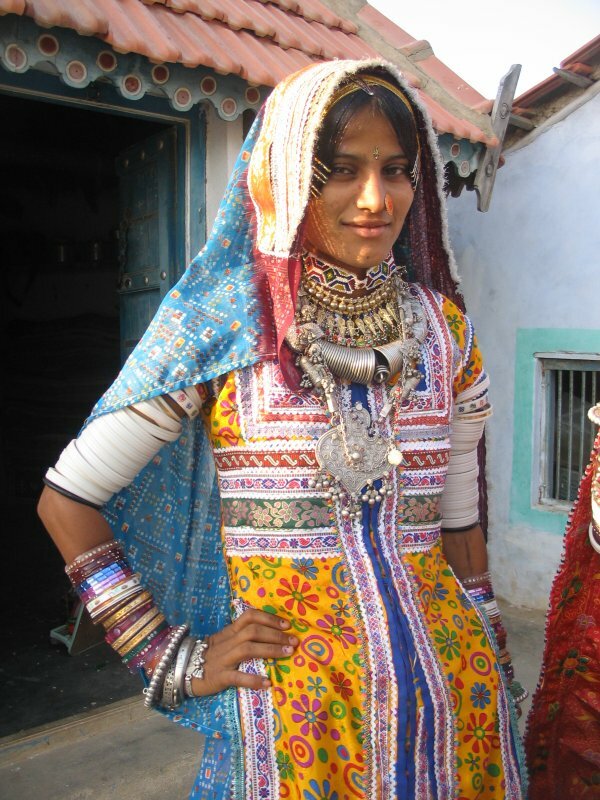 The embroidery of the Meghwal women is their pride and expression. A woman in these parts is, what her embroidery shows. They follow three main styles of “Bharat” literally translated means “fill-up”. 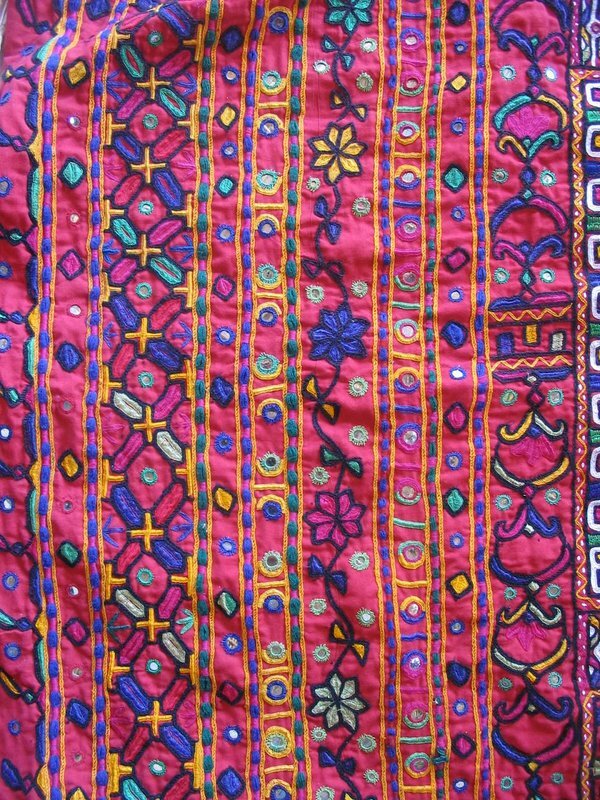 “Pakko Bharat” is a square chain stitch similar to the Rabbari embroidery. The stitches are so dense that they last a lifetime apparently. 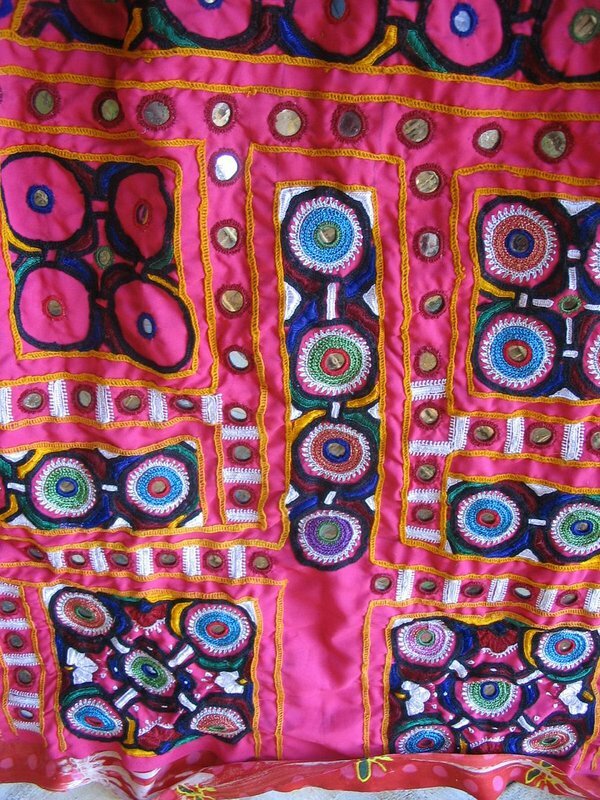 The colours are vibrant and the motifs happy as if to compensate for the stark environment. They extensively use typical white blossom; this is probably cotton blossoms reminiscent of the agriculture days, eons ago. 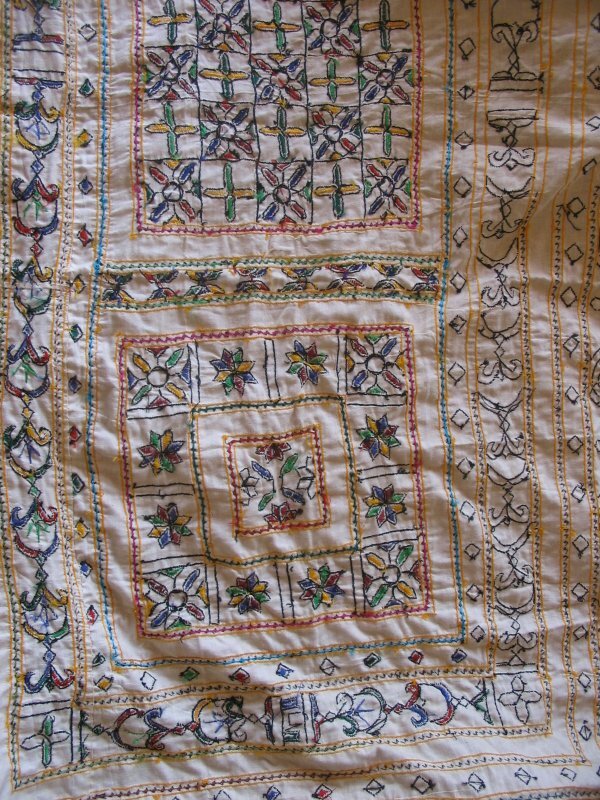 Mukka work is the use of silver thread in embroidery, needless to say the silver thread nowadays is silver only in colour. “Kharek” is geometric motifs filled with bands of satin stitch. 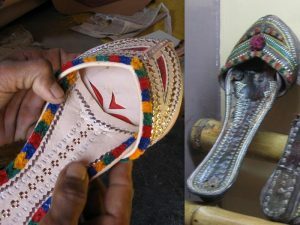 This style is a shared tradition among various communities in the area. 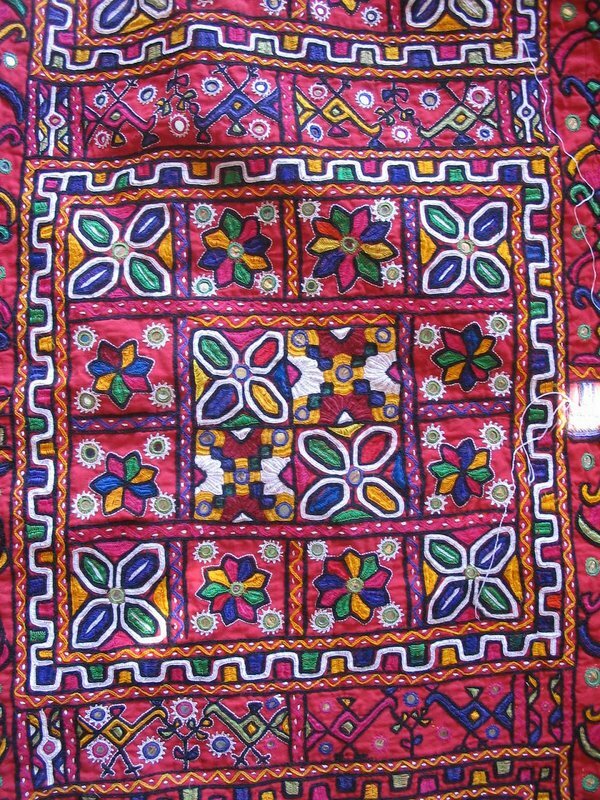 “Suf” is the probably the most precision oriented embroidery and is known for its fine work. It is a satin stitch counted on the warp & weft on the fabric, worked on the reverse. The geometric precision and poetic expression is very impressive. The clothing of the women is designed to be stylish or practical or both. The top “Kanjari”, a well ventilated backless long tunic filled with embroidery in front, is both practical in this heat and sensuous when required. The bottom is a lehnga skirt that used to be either woollen, mashru silk, woven printed cotton, but nowadays is mostly synthetic fabric. Stitched on borders and embroidery at the edges embellish the lehnga. They always wear an “odhini” traditionally tie-dyed that covers their head and back, especially when in presence of outsiders. The women are equally competent at adorning themselves with jewellery. My favourite is the spectacular “Vadlo” a hunsli, made of up to five different thickness of silver wires often weighing more than 700 gms for pure silver. At the junction where the wire is twisted on its axis, probably also the part where it touches the collar bone, it is covered with leather and embroidered by men. The women here may wear anywhere between two to three kilograms of silver. And then there is the famous gold nose ring “Velado” – a 4mm thick pipe that holds colored glass and gold beads. The diameter is 76mm approx. Across the ring runs a plate that is decorated with granulation and wirework. A woven bead lace that is fixed onto the hair by a clip balances the weight. Figure 14: A newly wed arrives home. The Vadlo is 600gms approx, the forearm bracelet 350gms approx., the Kataria wrist bangle with round spheres 300gms approx., the heart shaped pendant and neckpiece 200gms and anklets weighing 200gms each. The gold nose ring is 50mm dia, and gold earrings. The neck has one beadwork chocker and a brass chocker. The lengha is 4mtr of cloth and the temperature is close to 40 degree Celsius. Are you exhausted reading it? The girls love it and take great pride in carrying it all. The men equally flamboyant, show off the embroidered patches on the shirts with elan. Tall, handsome with sun burnt skins and loaded with talent, it’s a delight to watch both the men and women at work here. 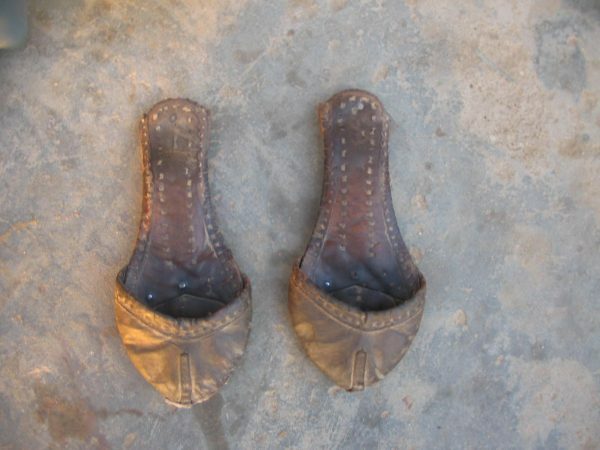 The products that they make, includes aspecialised footwear suit for the topography and weather in form of Jhalani Juti for women and heeled shoes for the men. Up to seven layers of leather are used and stitched using twisted cotton thread, to make this footwear a life-long product. 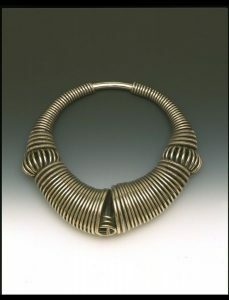 The horse saddle work using flattened silver wire is famous from this area. They also made water containers and all sorts of objects useful in daily rural life. The Meghwal houses are a delight to visit, the complete housing unit is usually two ‘bungas’ separated by a verandah in between. A bunga is a round mud hut with a conical thatched roof. 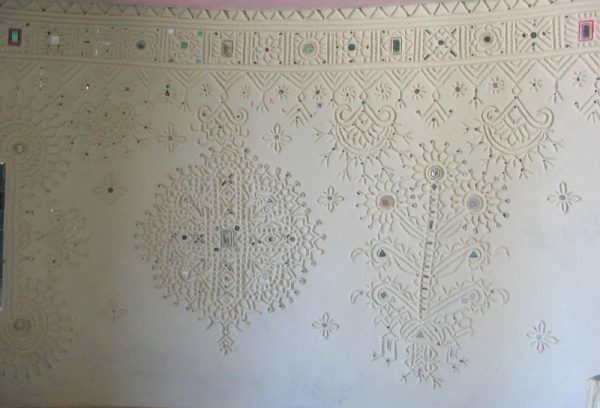 One bunga is the formal space where the walls are decorated with the embroidery like patterns in clay relief work adorned with mirrors, the wall shelves have utensils on display and other objects of use that were probably a part of the women’s dowry. The second bunga is the private space of the family and the open verandah is the living space. The kitchen is towards the corner of the private bunga for direct access. The toilet and bathroom are situated outside the house. Post the 2001 earthquake, pre-fab bunga had sprung up in great numbers, needless to say these were not so exciting but in those times a necessity for those who had lost their homes. A mud bunga is more earthquake resistant as the mud has more flexibility for movement. The most memorable was supper that we ate at dusk prepared by Pabi Ben, of dal along with fried okra and bajra rotis, all of this with a bowl full of ghee and jaggery! Bhoja bhai says, ‘this is the generosity of my wife and the goodness of my fortune’. Under the beautiful starry night and the cool breeze, I drift away into sweet sleep feeling immense gratitude. I hope to visit Bhoja Bhai and his loving people very soon.